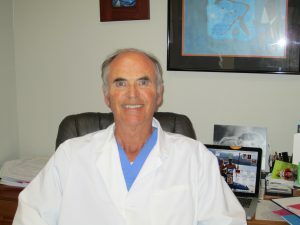 Dr. Jack Santone was born and raised right here in California and has more than forty years of experience in dentistry. Dr. Santone is an honors graduate of UC San Francisco Dental School, where he earned the Mosby Scholarship Award, the highest achievement award given by Delta Sigma Delta. He was ranked 5th in his graduating class, and was a member of the OKU Dental Honorary Society. Before his education and training at UC San Francisco, Dr. Santone graduated with honors from UC Berkeley, attaining his undergraduate education for pre-dental curriculum. He is also an honors graduate of San Dieguito Union High School, right here in the Solana Beach and Encinitas area. Dr. Santone is a lifetime member of the American Dental Association, and is also a member of the California Dental Association and the San Diego Dental Society. He holds membership in the prestigious American Academy of Cosmetic Dentistry, and has decades of expertise in state-of-the-art procedures such as porcelain veneers and crowns, tooth-colored bonding and fillings, bridges, dentures (full and removable), dental implants, endodontics (root canal therapy), and oral surgery. Dr. Santone has been using mercury-free materials in fillings for more than 17 years, and has removed all toxic materials from his office. He is committed to practicing safe removal of mercury fillings according to protocols established by the International Academy of Oral Medicine & Toxicology (IAOMT). Dr. Santone enjoys spending his free time with his family, and has special interests in boating and fishing. Please contact our practice for more information on Dr. Jack Santone, or to schedule an appointment.